Jeremy and I got back late on Sunday evening from a long weekend in the pacific northwest helping a dear friend celebrate her marriage. When Monday evening rolled around and we had seemingly no food in our house and I was out the door for a meeting when I quickly took inventory and started crafting a dinner plan in my head. This is what I came up with. I instructed Jeremy to bake 4 potatoes by scrubbing and stabbing the potatoes with a fork, salt and peppering the skins with a little bit of olive oil and to bake in tin foil at 400F for about an hour. I went off to a meeting and by the time I got home they were done. You can also do this ahead of time and refrigerate until you’re ready to use. When I got back I took the one good summer squash, onion and green bell pepper I had on hand and diced and sauteed them in a little more olive oil and sprinkled with taco seasoning. Yes, taco seasoning. I added about a 1/4 c of water to make sure it coated the veggies nicely and wasn’t too powdery. The water burns off in the pan and you’re left with perfectly seasoned vegetables. Sidenote: I’m kind of notorious for under-seasoning my food. It’s just not something I’m good at yet. So lately, I’ve been letting my favorite grocery store, Native Roots, do the work for me. They sell little spice mixes (just enough for one or two meals, which is perfect) that they’ve mixed themselves. Meanwhile, while I’m cooking the veggies (just until tender), Jeremy is cutting the potatoes in half and scooping out the insides into a medium sized bowl. After the veggies are done cooking I dumped them in the same bowl and mashed everything together. I add about half my cheese to the mix as well. Then I lined up all the halves (you should have 8) into a baking dish (8×8 should be fine). I sprinkled the rest of the cheese on top and baked under the broiler for about 10 minutes – just enough time for the cheese to melt and get a little bubbly. I garnished the dish with some fresh chives and a little more salt and pepper. 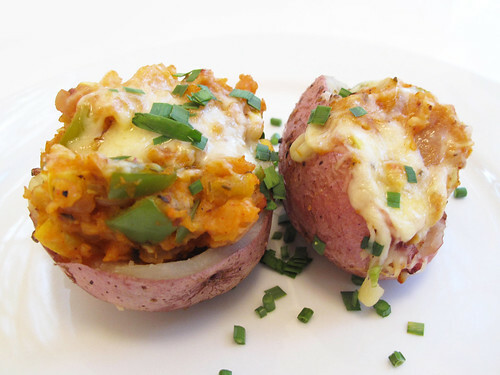 Note: this dish could easily be made vegan by leaving out the cheese or using a substitute. I’m usually a red wine drinker (shiraz and syrah are my favorites right now) but in the summertime it’s just too hot to enjoy a glass of wine. So I’ve appropriately switched to beer for the season. 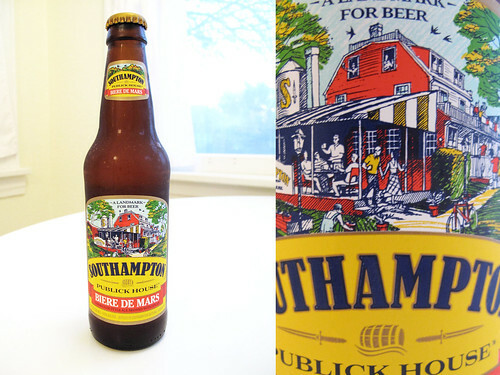 This Southampton beer is delicious – if I were fancy I would describe the flavors with eloquence, but I’m not fancy. So I won’t.